When you imagine California, your mind wanders to thoughts of sunshine, palm trees, beaches, and warm days. That may even be the reason you chose to move there. (Maybe not entirely, but surely it helped!) 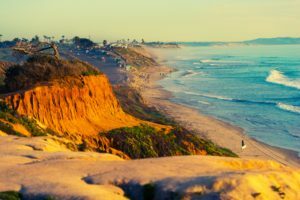 As you plan your move to California, the last thing you want is to stress over the details, but how can you avoid that when moving is stressful in general? The answer could be as simple as hiring a team of professionally-trained packers and movers. At Vincent Fister Inc., our expert team strives to provide you and your family with the highest-quality service imaginable. For more than six decades, our company has provided our clients with excellent service throughout corporate, office, residential, and international moving, as well as storage and distribution. We know that moving can be overwhelming, but you can rest assured that you are in experienced hands. We guarantee a moving experience so stress-free, that you wouldn’t mind doing it again in the near future. We know that your time is valuable, which is why we also offer you the ability to request the amount of movers you will need, as well as select a preferred timeframe that fits your schedule. With decades of experience in the moving industry, we have perfected our efficient moving strategy to be safe, affordable, and most importantly stress-free. You can rest assured that our experienced movers will have you on the road in no time. However, if you happen to sell your current home before you’ve finalized the details of your move, we also offer convenient storage options for you to consider. Our high-quality storage facilities can house your family’s belongings both short and long-term while you wait for your moving day. Our goal is to remove some of the stress from your timeline, so that you can focus on other aspects of moving to California. With such a high population, California’s cost of living expenses are some of the highest throughout the U.S. At Vincent Fister Inc., you have our word that we won’t add any unnecessary expenses to your move. We strive to provide all of our customers with an easy-to-follow pricing guide to alleviate any financial stress. You will know ahead of time what the cost will be for the distance you’re traveling, and there will never be any surprises or upcharges. Instead of spending your first few days in California waiting on your belongings to make it to your new home so you can start unpacking all over again, let us handle it for you. Our movers will not only help you pack up your entire home, but will also do the unpacking for you as well. Whether you want assistance unpacking the whole house, or just the heavy items, we will handle each item with care. Our trained movers are fast and efficient so you can spend more time exploring California with your family, and less time unpacking boxes. At Vincent Fister Inc., we guarantee an easy, stress-free experience every time. Contact us today to schedule your next move! We are located in Lexington, KY and proudly serve the surrounding areas.